Bonsoir! 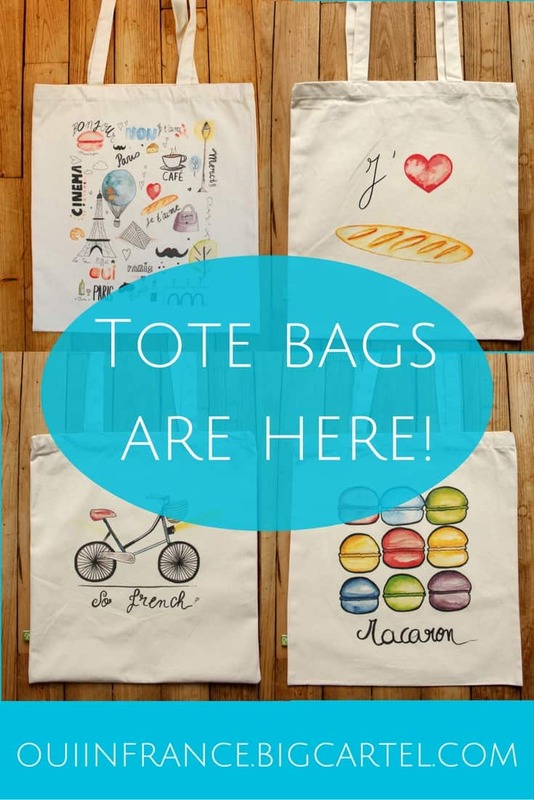 This is a special weekend for 2 reasons: 1) It’s my birthday tomorrow and 2) I’m now offering tote bags in the Oui In France shop! 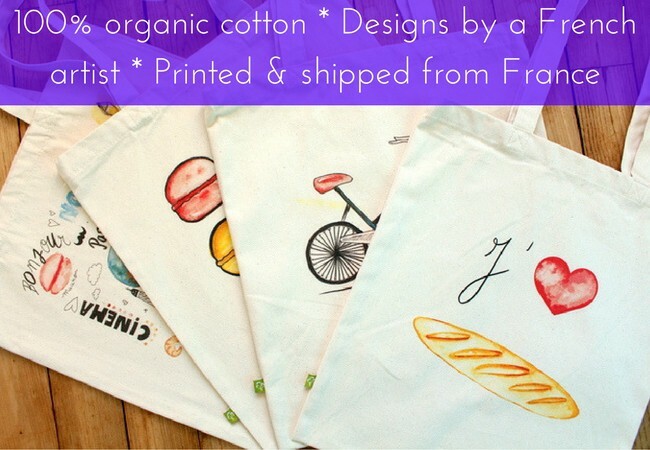 As you know, I launched the Oui In France shop in November with 3 custom Francophile t-shirts and now I’m adding 100% organic cotton tote bags to the mix. 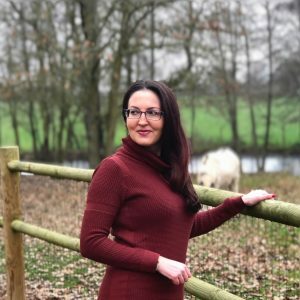 I have 2 new designs to show you along with a special launch offer. I’m offering free worldwide shipping! I work with a French artist locally who brought my ideas to life with her paintbrush and pen. Everything was drawn and painted by hand so you’re getting an authentic French product shipped by me personally from France! 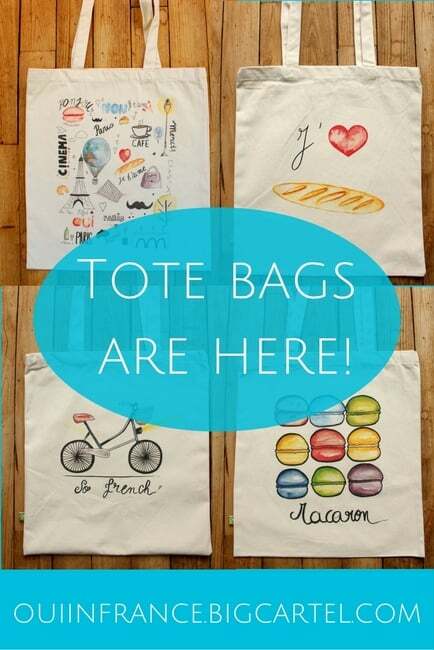 Totes and t-shirts are available and ready to ship Jan. 4! I’m offering FREE WORLDWIDE SHIPPING to celebrate the tote bag launch. 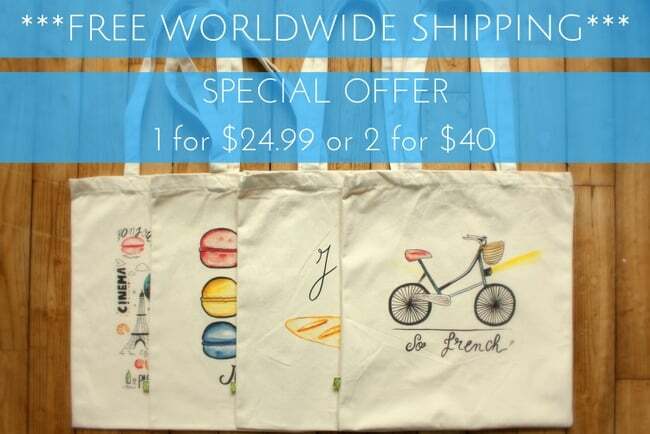 Pricing is 1 tote bag for US$24.99 or 2 tote bags for US$40 with free worldwide shipping included on tote bags only. They’re shipped via the most economical method at the French post office (no tracking including) and arrive in about 10 business days. You can mix and match any way you’d like. This limited-time launch offer won’t last, as quantities are limited, so head over to the Oui In France shop to grab your bag(s) now. To get the special 2 for $40 mix and match offer, you must enter promo code TWOBAGS at checkout to get the price to adjust to an even $40. You can pay with Paypal or credit/debit card. NOTE: I’d be happy to write a special message and ship directly to a friend or family member if you’re buying a gift. 😉 Just include any instructions in the message field during checkout. I hate crappy, cheap materials and that’s why I took choosing a bag (and my t-shirts) very seriously. I stand behind my products and went through several sample bags before deciding on THE bag I wanted to offer in the shop. 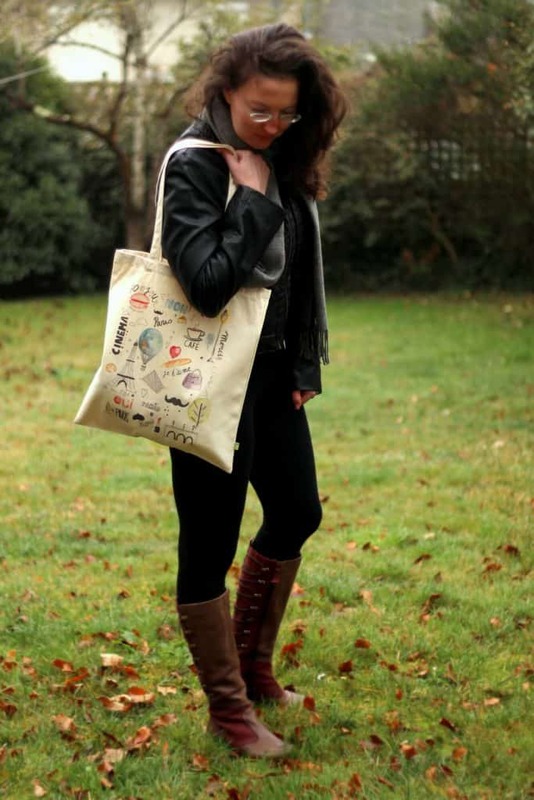 The tote bag is 100% organic cotton meaning the cotton was farmed naturally without the use of pesticides. Use it for a quick grocery run, to run errands or commute to work. 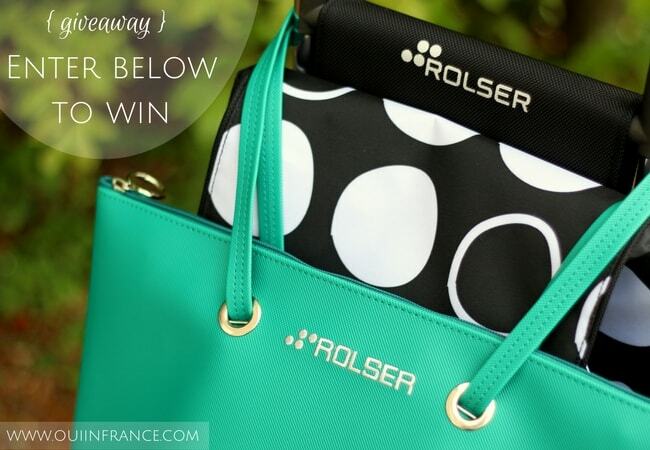 This sturdy bag is up to the task! 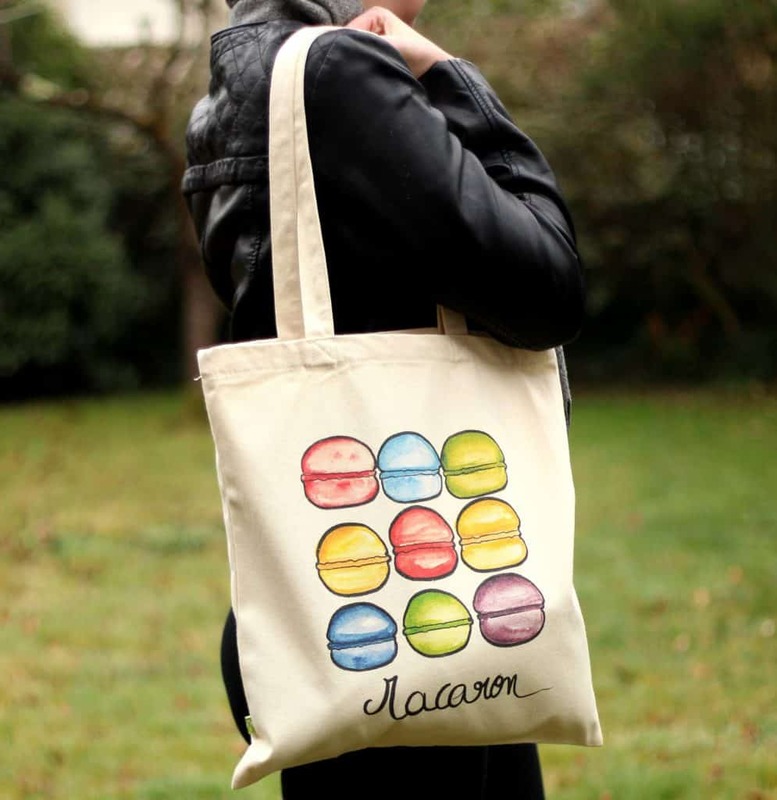 All designs are printed locally on this natural-colored heavyweight bag via DTG printing. The designs are printed onto and into the fabric of the bags (almost like a tattoo is inked into skin) and are not ironed on or anything like that. These are high-quality bags you’ll be proud to show off! I love all the designs but I have to say that the Francophile Scene is really stunning in person. The colors printed beautifully and the collage has a little bit of everything. But really, you can’t go wrong with any of the bags. 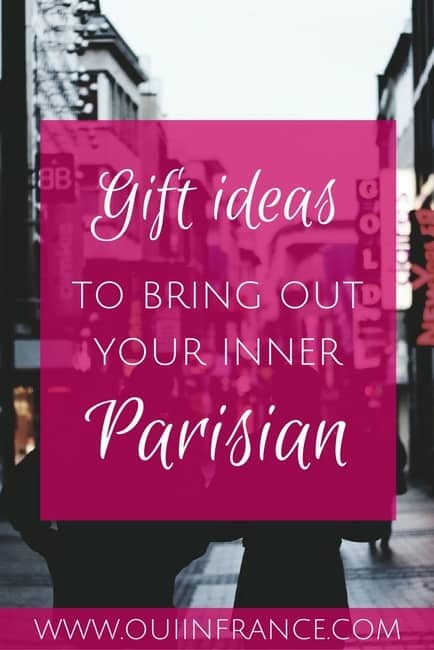 Head to the Oui In France shop here to take a look! 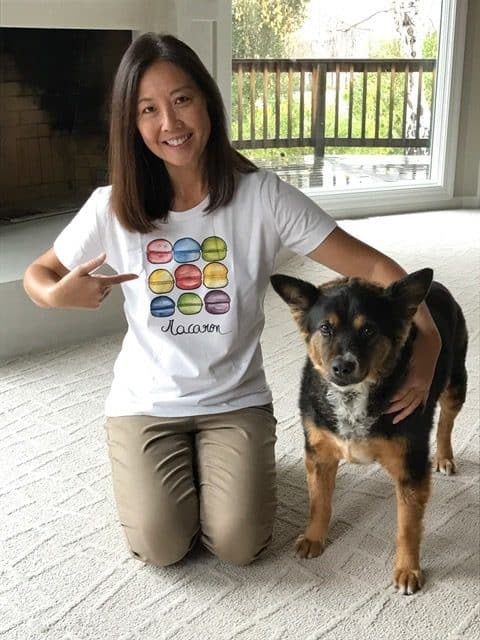 I love my macaron t-shirt. Not only is the design super cute, I like the weight of the fabric and the flattering cut. Good job! I was impressed with the quality of the shirt fabric. It was luxuriously soft and the fabric appropriately thick. The image came out really well; I actually like it even better “in person” than the site. I’m happy I bought two! 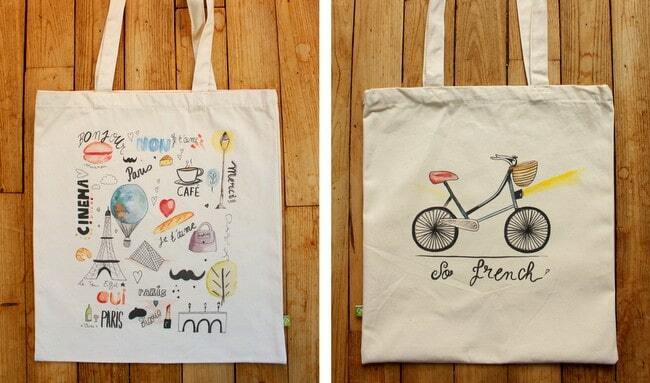 Can I ask for your help to get the word out about my new tote bags and shop? A quick share on social media would be incredible. Thanks so much for browsing, sharing on your site/social media and buying. I appreciate your support so, so much. I know I’ve said that before and words on a page can only convey so much, but I mean that with every fiber of my being. 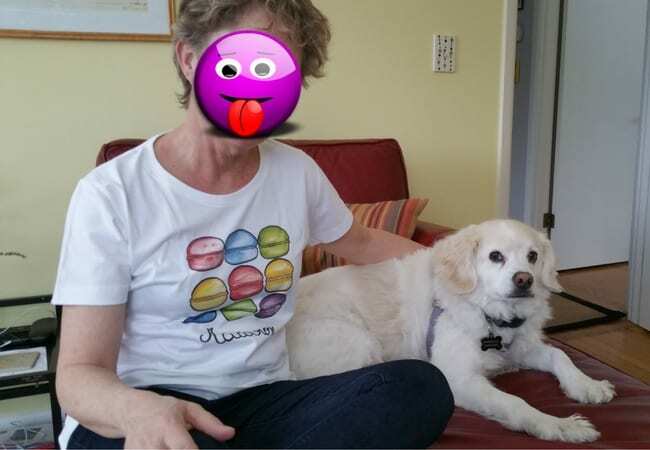 Francophile t-shirts? Yes! 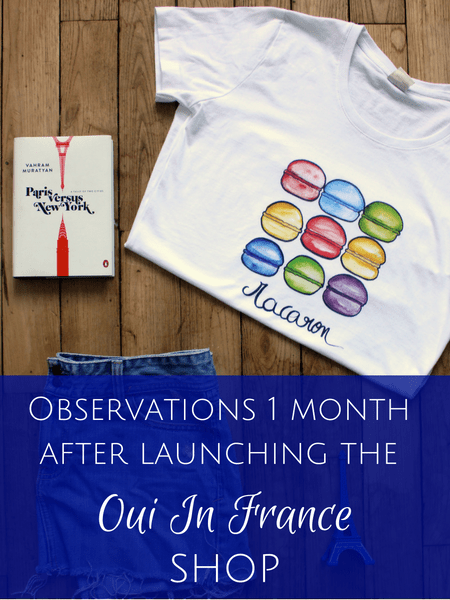 Introducing the Oui In France T-Shirt Shop Oui In France’s 5th birthday & Rolser shopping trolley review (GIVEAWAY) Observations 1 month after launching the Oui In France shop French gifts for Francophiles to bring out your inner Parisian My French vintage Etsy shop is open for business! « A fine example of customer service in France… NOT! May I use the main image of them on the VDM twitter and facebook to place with a link to this page? It would give the more of a push I think. They are so cute!! Tote bags are brilliant. I love the new designs!!! I can’t decide which one is my favorite.